When it comes to performing a squat not all are created equal. Squatting is a great exercise for some people and disastrous for others. 1. Length of the tibia, femur, spine. 2. The structural development of the Greater Trochanter of the femoral heads. 3. The Q-Angle: This is based on the structural size and width of the pelvic girdle and it’s effect on the angle of the knee and ankle joint. 4. Articular surfaces and integrity. 5. Proper postural musculoskeletal support. Many people live in chronic lumbo-pelvic and/or scapular thoracic pain without ever realizing that the root cause could be that they are not biomechanically designed to perform a standard squat. They would need to do an alternative exercise or modify what they are doing. 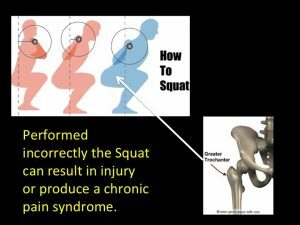 I suggest seeking the help of a professional to help determine which particular type of squat is BEST for you.